I am always enthusiastic over the release of a musical legend's biopic. It's disheartening that a great amount of younger music fans have never been given the opportunity to hear some of the musical genius from many dearly departed maestros! Jimi: All Is By My Side left me and my group of friends with much disappointment. The story is set during a time in Jimi Hendrix's life when he leaves New York City and finds fame in London. Most of the film is based on his personal life in London and ends as he heads to the United States for a major tour. Aside from a poor screenplay, the film looks very poorly done. The portrayal of the guitar wizard performing left a lot to be desired. Adding insult to injury, Jimi's estate didn't allow his music to be used in the film. As my friend said the night of the film, "How do you make a Jimi Hendrix film without his music? YOU DON'T"! Kathy Etchingham is the former girlfriend of Jimi Hendrix and is portrayed in the film by Hayley Atwell. Etchingham recently allowed me the distinct pleasure of hearing her thoughts about the film, her characterization in the film and her relationship with Hendrix. Mr Nashville: I want to thank you so much for the honor of granting this interview. We both have unfavorable views of the new film Jimi: All Is by my Side. Obviously, your views go deep as your portrayed in the film; this was part of your life and your relationship with your beau Jimi Hendrix. Before we go into deep conversation and questioning I'd like to ask you what you thought of Andre Benjamin's portrayal of Jimi. I found him to be the only saving grace of the film. Speaking only of his character recreation and not any of the content, plot or script, Andre seems pretty spot on. In this same manner how did you feel about Andre's performance? Kathy: I’m afraid I must disagree with your assessment of Benjamin’s performance. Firstly I felt he was miscast because he is far too old and stiff for the part. I noticed he struggled to get up from kneeling on the floor while “playing” the guitar whereas Jimi was so fit and agile he could spring up like a gymnast in one smooth move. Secondly he was very badly directed and given a ridiculous script. I think what the writer has done is taken Jimi’s interview persona and thought that was how he spoke in normal speech. He didn’t. In interviews he was a different person. He hated interviews and was rather shy so he put on rather hippy Greenwich Village mannerisms and mumbled. In real life he was sharp and witty and was a tremendous mimic. He had a tremendous sense of humour. Because of his acute musical ear he learnt very quickly to distinguish and mimic the different English accents. His David Frost was brilliant, and physically he could mime too and I nearly choked seeing him miming Mick Jagger’s dancing behind his back. By the way he never said that business about the power of love and the love of power. That was an English Prime Minister from the 19th century called William E Gladstone. Mr Nashville: Are you in contact with any of Jimi's children? Any word on their reaction to the film? Mr Nashville: I find it pretty frivolous that John Ridley would write a screen play, pass it off as properly researched, yet never speak to you. Did the two of you speak after the film was released? Did he ever give a reason as to why he didn't reach out to you? Kathy: I have never spoken to John Ridley before or after the film was released. Mr Nashville: Actress, Hayley Atwell, portrays you in the film. Typically when playing a character the actor/actress wants to utilize every resource available. Did she reach out to you? Kathy: Hayley Atwell has not made contact before or after the film was released. Mr Nashville: I felt her portrayal of you seemed to be the pretty obedient, battered love interest cliche. How did you feel about her portrayal of you? Kathy: I thought it was an absolutely ridiculous and offensive portrayal and cannot conceive why Ridley wrote and directed such nonsense and why she would want to play the part in that way without knowing anything about me. Mr Nashville: Mr. Ridley included a scene in which Jimi beats you with a pay phone. Would you like to share your thoughts on this? Kathy: It never happened and is a terrible slur and slander of Jimi. Mr Nashville: What are your thoughts about the way Linda Keith was portrayed? Kathy: Linda Keith is portrayed as a mature but prissie goodie-goodie. In fact she wasn't around and Keith Richards was so concerned for her health that he instigated an intervention so that she had rehabilitation treatment at around the time Jimi came to London. She was involved in a fight at the Scotch of St James which caused Chas to panic and ask me to get Jimi back to his hotel. That is how we met and I stayed with Jimi after that. 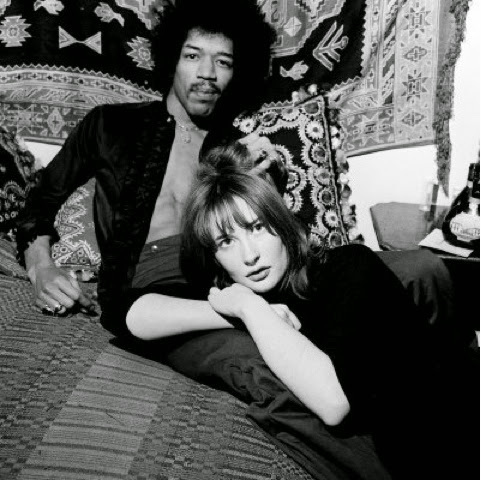 The next morning she broke into our hotel room screetching and waving Jimi's guitar over her head. After that performance Chas banned her from the hotel and the receptionists knew about her. She tried a couple of times but was prevented from entry. Mr Nashville: Was Jimi as close to Linda Keith as portrayed in the film? Kathy: No. She disappeared off the scene after her performance at the Hyde Park Hotel.We never saw her again. Brian Jones told me in 1968 that she went round to his rented flat and took an overdose while he was out working. He didn't say how she got into his flat. He was very agitated because as a result he was evicted by his landlord because his landlord thought it was his drugs and he had paid six months rent in advance and lost it all. Mr Nashville: Mr X is a man in the film that I'd like you to compare facts and fiction. Kathy: Michael X was a criminal con man masquerading as a black power activist. Jimi and I went round to his flat in Notting Hill Gate but left in a hurry when he started to be abusive and aggressive when Jimi didn't give him money. He started using foul language and called Jimi a traitor to his race for having a white girlfriend which was a bit stupid because he was of mixed race himself and had a white girlfriend himself. He was executed in the West Indies for murder. He murdered a young woman by chopping her up and burying her alive. Mr Nashville: If you were to give the narrative of a Jimi Hendrix biopic what would you like to see included? Kathy: The true story of the amusing and creative times that were happening in London when Jimi arrived and how he contributed and was appreciated by the musicians and the public in Britain. He had a wonderful sense of humour and was very funny and entertaining. Mr Nashville: What's the biggest misconception about Jimi? Kathy: I think that a lot of people think his stage performance was the "real" Jimi. He was in fact a very normal quiet and amusing person in private. Mr Nashville: In 1992, you asked that Jimi's death be investigated. Reports are that Scotland Yard's investigation was inconclusive. Do you think Monika Dannemann was responsible in any way? Kathy: I think Jimi died of inhalation of vomit and Monika's only error was delaying calling the ambulance for hours and getting people around to clear the hotel room up. I am sure he was already dead but she was paralysed with fear. She was terrified of what her father would think because he was an old Nazi. Mr Nashville: I can't thank you enough for granting me this time to inquire about deeply personal, painful subjects. I believe Kathy Etchingham is very credible. John Ridley wrote the screenplay for another bio pic, Twelve Years A Slave. In that film a scene was admittedly fiction, had nothing to do with the plot and demeaned Solomon Northup's character as a devoted husband and family man. It's a small scene, less than 5% of the film in which Northup masturbates a female slave. RCA Studio Saved! Is Nashville Still Music City? Could Johnny Carson be heading to Broadway?